in the last decade indoor skiing has grew substantially around the world and it’s about time it enters italy and there is no better place for it than turin. in the last decade indoor skiing has grew substantially around the world and it’s about time it enters italy and there is no better place for it than turin. indoor ski facilities are not a fantasy for mountainous regions, as relying on snow conditions represent a crucial economic prerequisite for the skiing industry. the lack of snow due to low precipitation or high temperatures is an immense challenge for winter sport destinations. the same snow-making technology used in alpine resorts is utilised in indoor ski facilities, without the negative implications that artificial snow often has on fauna and flora of natural slopes. enclosed spaces make this process more efficient and reliable, notwithstanding, the quality of achieved snow is greater. 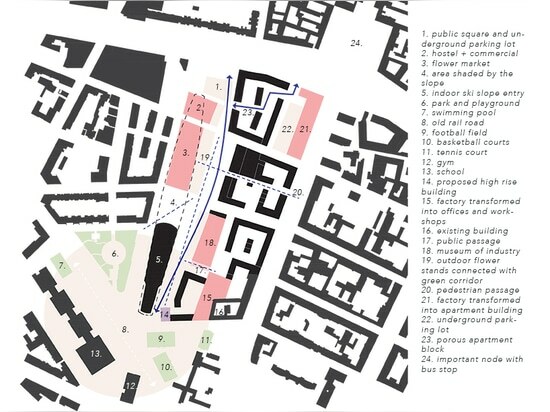 ultimately, veronica camuncoli and piotr pietras’ proposal doesn’t compete with real pistes, rather presents an alternative to swimming pools, skateparks and hockey rinks. 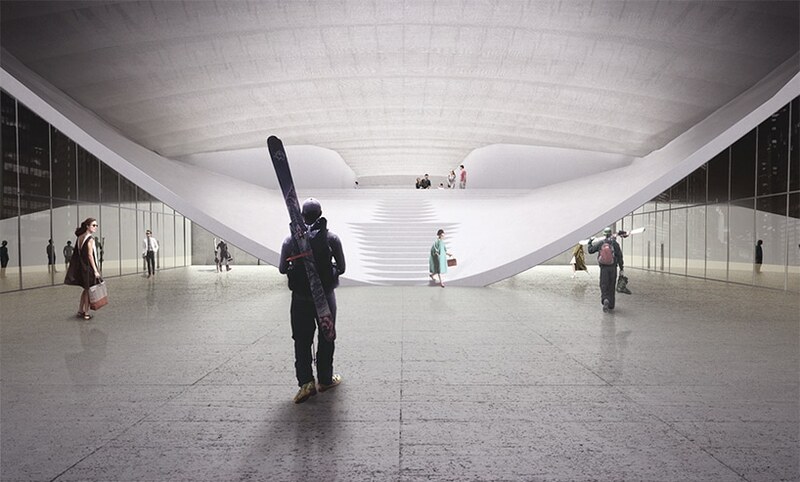 turin’s tourism would boost having the first indoor ski slope in the region and in italy, allowing it’s citizens to practice their favorite mountain sports all year long on real snow in the heart of the city. rapid deindustrialization in the 80s left the city with an enormous amount of ecologically degraded and disused land. large voids in the urban grid give opportunities to stop urban sprawl by building inwards and filling in the gaps. one of them, the ex-fiat engines factory, poses favorable conditions for experimentation with unusual building type of substantial size that otherwise wouldn’t find space in the city. 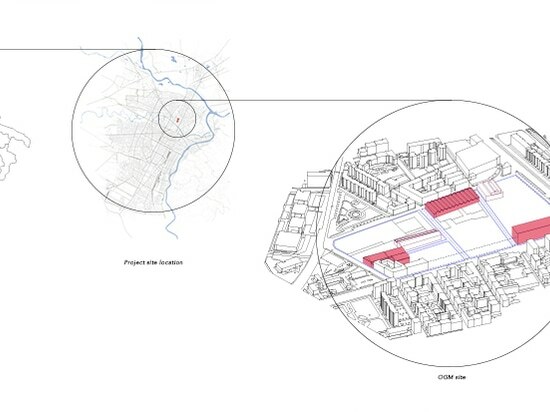 the master plan proposal for officina grandi motori is designed around a green corridor which stretches through the site and reconnects with an abandoned railroad which once served various factories located along it. the green corridor is a way to organise the site, making it more porous and denser in other parts. notwithstanding, its constitutional objective is to allow larger buildings to breath and for empty spaces to help maintain industrial scale. 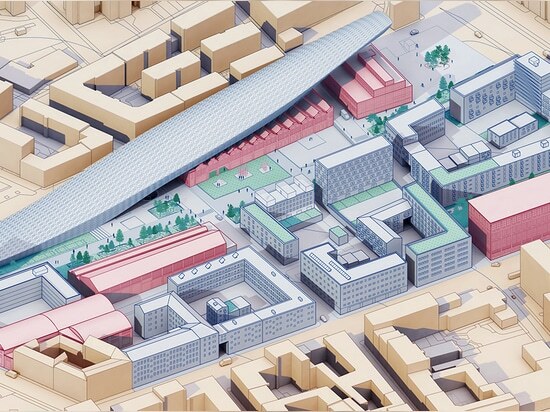 the student design team’s proposed mixed use development includes restoration and adaptation of existing factory buildings to host, desired by the municipality, flower markets and museums. furthermore, commercial spaces, hostels, and restaurants are intertwined with green public spaces. 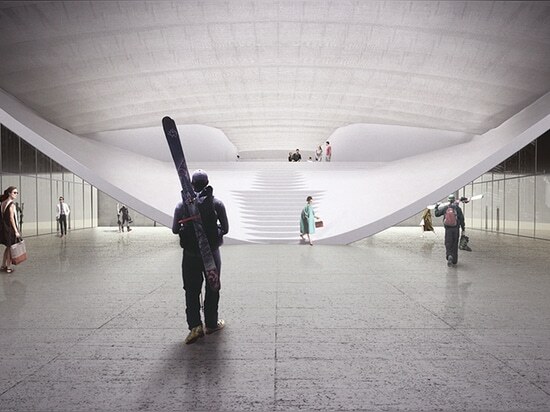 the final shape of the indoor ski slope building is a result of section studies of various iterations. the dialogue between curvatures and functionality of piste. the heart of this proposal is a unique piste, angled at 15% with length of 260 m, hidden inside a 340 m long building. the canopy of the piste is visibly curved to minimise the vacant spaces inside. the highest point above the piste holds a chairlift for skiers and snowboarders. from the outside curvatures reduce the surface area of envelope and likewise modulate the perception of the building, making it look much thiner. the skin of the building is designed in stainless steel panels cut in tessellated pattern which draws inspiration from skiers plunging through fresh powder. the dynamic expression is achieved by lifted parts of panels to the outside. the wings create gradients of shadows on top of the skin surface, which change through out the day. each of the hundreds of pieces is part of a large playful collage, which helps to break down the volume of the building. the inside of the piste is designed as an interactive skin. strips of membrane hide the structure and give piste sense of purity and rhythm when going down the hill. thanks to multiple motors and changeable led lighting, the skin can dynamically respond to movement of users or be set as a static sculpture. investment in new technology is a way to attract customers, differentiate from competition and a way to project indoor skiing into the future as something clearly distinct from outdoor skiing. 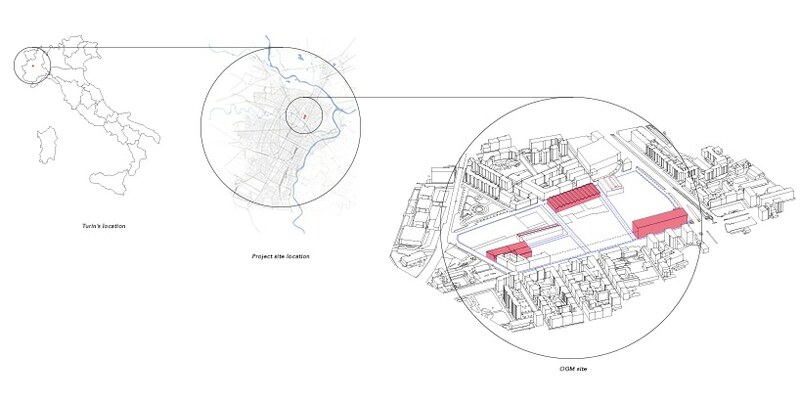 the presented student proposal has been designed based on analysis of the post-industrial imprints in relation to the structure of the city and an in-depth research of turin’s transformation and its wish to rebrand itself.